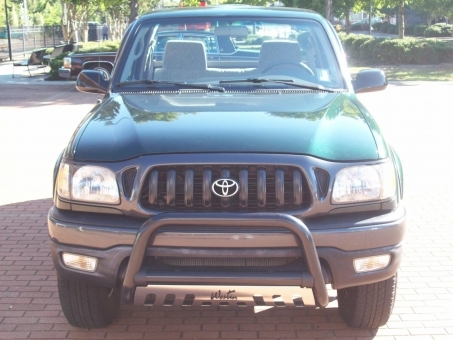 2001 TOYOTA TACOMA PRE-RUNNER 2WD REG CAB 3-PASSENGER 2-DOOR TRUCK. This vehicle comes powered by a 2.7L 4-Cylinder Engine along with an Automatic Transmission. Colored in a Dark Green Pearl Finish -6Q7- over a Gray Cloth Interior. Other options and features include: A/C, Tilt Steering, JVC Stereo w/ CD, Dual Airbags, Running Boards, Bed Liner, Tow Package, Traction Control + ABS, Factory Carpet Mats, Diamond Plated Tool Box, Vent Visors, Brush Guard, Mud Flaps, and 16-inch Steel Wheels on matching Dunlop Tires. This vehicle has NEVER been smoked in + books and owners' manuals are in the dash.